Designed to help practitioners using FT-IR capitalize on the plethora of techniques for modern FT-IR spectrometry and plan their experimental procedures correctly, this is a practical, hands-on reference for chemists and analysts. It's also a great resource for students who need to understand the theory, instrumentation, and applications of FT-IR. Peter R. Griffiths, PhD, is a Professor of Chemistry at the University of Idaho. He has published over 250 papers on various aspects of vibrational spectroscopy; most of his research is oriented towards solving problems by infrared and Raman spectroscopy. He has also edited eight books on this subject. He teaches several courses on aspects of infrared spectroscopy with Dr. de Haseth, and is the director of the workshops that are held every summer at Bowdoin College. He has won numerous awards including the SSP Award and the Bomem-Michelson Award. James A. de Haseth, PhD, is a Professor of Chemistry at the University of Georgia. He has worked with FT-IR spectrometers for over thirty years and has published and lectured extensively on their operation and performance. CHAPTER 1. INTRODUCTION TO VIBRATIONAL SPECTROSCOPY. 1.4. Widths of Bands and Lines in Infrared Spectra. 2.2. Generation of an Interferogram. 2.3. Effect of Finite Resolution. 2.6. Effect of Beam Divergence. 2.7. Effect of Mirror Misalignment. 2.8. Effect of a Poor Mirror Drive. CHAPTER 3 SAMPLING THE INTERFEROGRAM. 4.4. Fourier Transform: Pictorial Essay. Appendix: Manufacturers of FT-IR Spectrometers. CHAPTER 6 OTHER COMPONENTS OF FT-IR SPECTROMETERS. 6.1. Infrared Radiation Sources for Transmission and Reflection Spectrometry. 7.2. Trading Rules in FT-IR Spectrometry. 7.4. Other Sources of Noise. 7.5. Interferometers Versus Grating Spectrometers. CHAPTER 8 PHOTOMETRIC ACCURACY IN FT-IR SPECTROMETRY. 8.2. Effect of Spectral Resolution. 8.6. Linearity Between 100% and 0%T. 9.4. Linear Least-Squares Fitting Methods. 9.12. General Guidelines for Calibration Data Sets. CHAPTER 11 CONVENTIONAL TRANSMISSION SPECTROMETRY. 11.2. Gas- and Vapor-Phase Samples. 12.4. Applications of Linear Dichroism. 13.2. Fresnel Reflection from Bulk Samples. 13.3. Infrared Reflection–Absorption Spectrometry with Metal Substrates. 13.4. IRRAS with Dielectric Substrates. CHAPTER 14 MICROSPECTROSCOPY AND IMAGING. 14.1. Microsampling with Beam Condensers. CHAPTER 15 ATTENUATED TOTAL REFLECTION. 15.4. Accessories for Multiple Internal Reflection. 16.1. Theory of Diffuse Reflection. 16.2. Accessories for Diffuse Reflection. 16.3. Applications of Mid-Infrared Diffuse Reflection Spectrometry. 16.4. Applications of Near-Infrared Diffuse Reflection Spectrometry. 16.5. Reference Materials for Diffuse Reflection Spectrometry. 17.2. Infrared Emission Spectra of Gases. 17.3. Infrared Emission Spectra of Condensed-Phase Samples. 17.4. Transient Infrared Emission Spectroscopy. 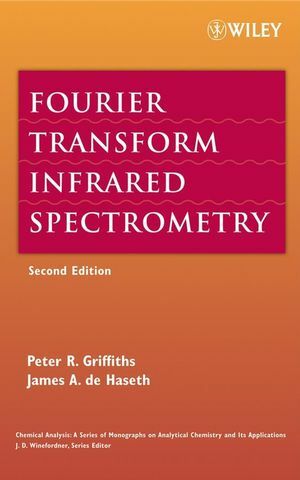 CHAPTER 18 FOURIER TRANSFORM RAMAN SPECTROMETRY. 18.3. FT Raman Versus CCD Raman Spectrometry. 18.4. Applications of FT-Raman Spectrometry. 19.2. Time-Resolved Measurements Using Step-Scan Interferometers. 19.4. Asynchronous Time-Resolved FT-IR Spectrometry. 20.1. Photoacoustic Spectroscopy of Gases. 20.2. Photoacoustic Spectroscopy of Solids with a Rapid-Scanning Interferometer. 20.3. Photoacoustic Spectroscopy of Solids with a Step-Scan Interferometer. CHAPTER 21 SAMPLE MODULATION SPECTROMETRY WITH A STEP-SCAN INTERFEROMETER. 21.1. Dynamic Infrared Linear Dichroism Measured with a Monochromator. 21.2. DIRLD Spectrometry with a Step-Scan Fourier Transform Spectrometer. 21.4. DIRLD Spectrometry with a FT-IR Spectrometery and Digital Signal Processing. 21.5. Other Sample Modulation Measurements with Step-Scan Interferometers. 23.3. Mobile-Phase Elimination Approaches for GC/FT-IR.